Last chance. 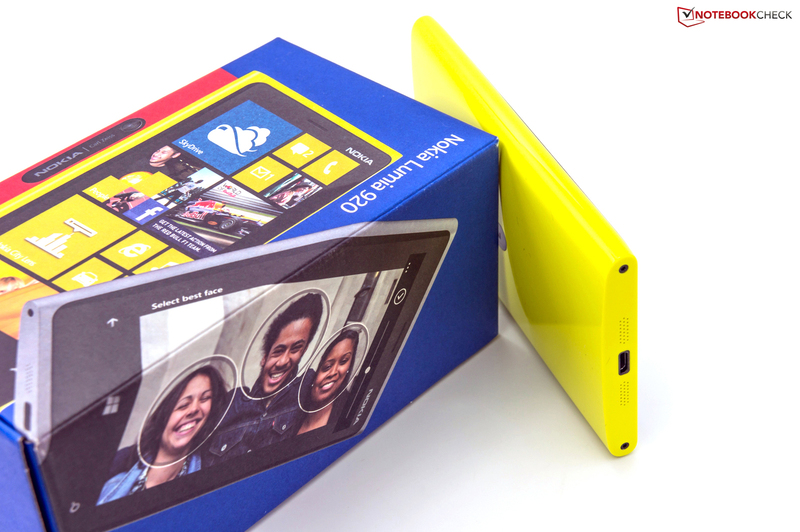 Nokia is one of Microsoft's most important partners for launching the Windows 8 Phone. The Lumia 920 stands out from the contenders with a unique design, good camera and additional apps. The Finnish company demands 649 Euros (~$860 RRP) for the premium model. Nokia was likely the most important company at the time of simple cell phones. However, it missed the leap into the age of smartphones and held tight to its Symbian operating system. Nokia's next step would have been expected with the introduction of Apple's iOS in January 2007 and Google's manufacturer independent Android operating system in 2008. However, we waited in vain. Microsoft and Nokia now collaborate with the launch of the Windows Phone 8. Increased advertising is to lure potential customers of iOS and Android. Other manufacturers like Samsung or HTC also offer smartphones featuring Windows Phone 8, but also have devices with Google's Android in their portfolio at the same time. Nokia presented three differently priced models at the launch of the current portfolio. 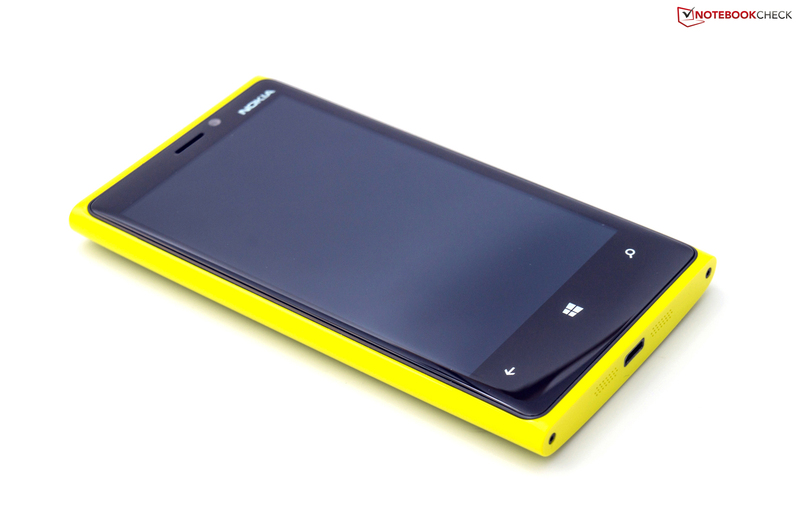 The recently debuted Lumia 620 starts it off as the entry-level version. 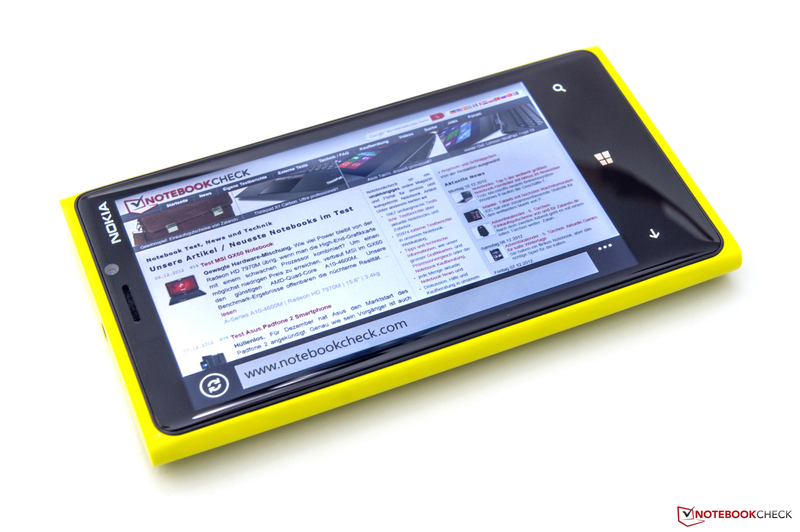 It is followed by the midrange model Lumia 820. 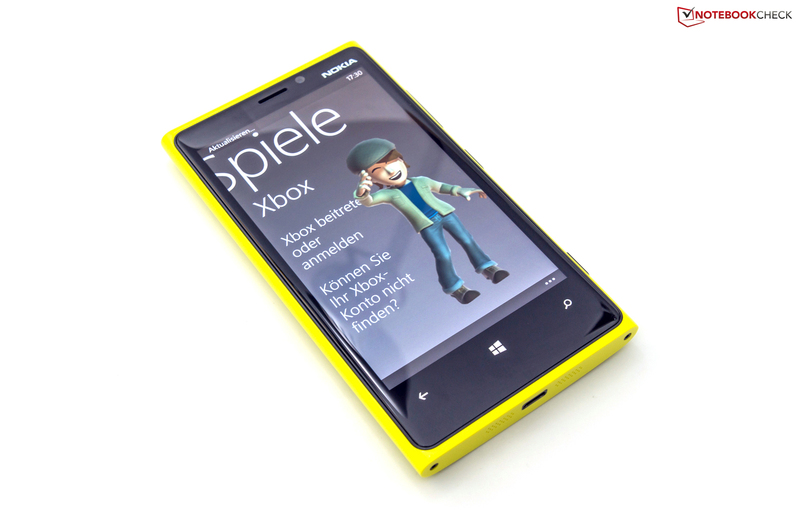 We are testing the flagship dubbed Nokia Lumia 920, which is to be sold for 649 Euros (~$860 RRP). The key specs are its high-quality, 8.7 megapixel camera alongside an optical image stabilizer, proprietary applications for Windows 8, a peta-band LTE chip for swift Internet access, 32 GB of internal memory and a high-res 4.5-inch screen featuring 332 dpi. 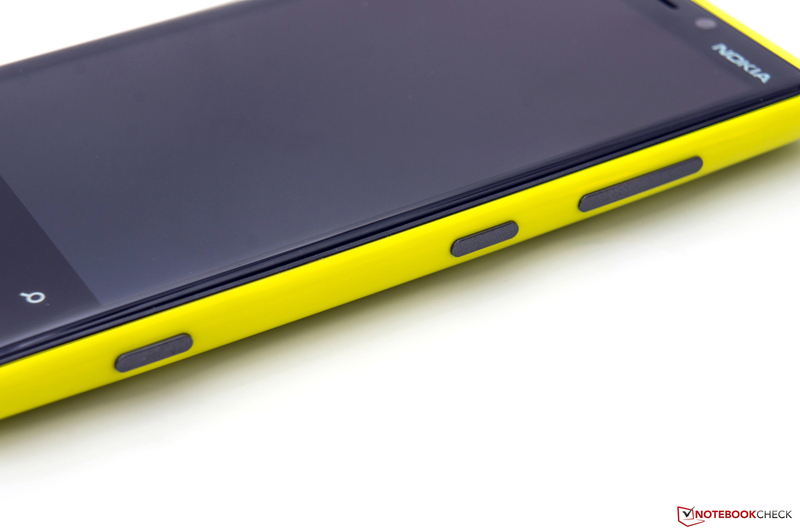 We are taking a close look at Nokia's Lumia 920. 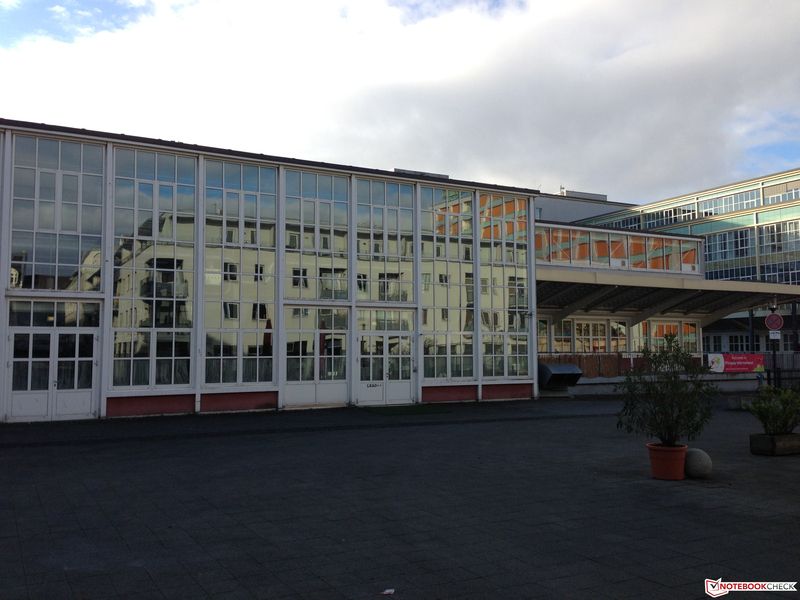 Will Nokia successfully grasp what is probably its last chance? A yellow cracker! At least in our case. Nokia also offers the Lumia 920 in red, black and white. But it is not just the colors that differ. For example, the black model's casing features a matte finish in contrast to the yellow model which is made of high-gloss poly-carbonate. The sleek surface has its pros and cons. The good grip is positive. It is not slippery. On the other side, the casing is very susceptible to small scratches which cannot be prevented. 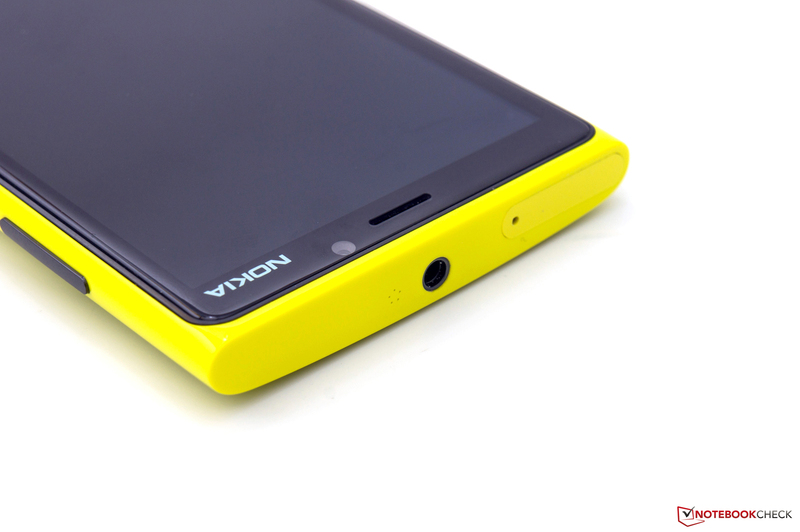 We find the looks of the Lumia very appealing. The blend of rounded sides and the linear finish at both the top and bottom make a very solid impression. 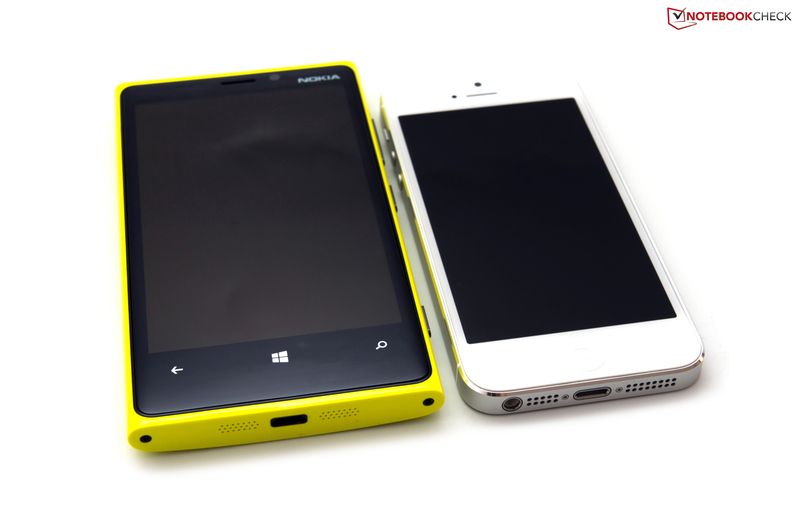 However, it looks very bulky in contrast to Apple's iPhone 5 or HTC's Windows Phone 8X. Its stability also makes a very good impression. The phone only warps marginally even when stronger force is applied. We did not ascertain any unusual noises. The clacking noise produced when shaking the phone should not discomfort the user. It is the camera's optical image stabilizer. The noise is very quiet. The phone will usually not be moved to such an extent as that this noise would be perceived in everyday use. Nokia does not surprise in terms of maintenance. The battery is built-in and cannot be replaced (mono-block build). This is certainly an advantage for Samsung's ATIV 2 smartphone in the WP8 category. Finally, we compare the hard facts: Nokia's Lumia 920 features a size of 130 x 71 x 10.7 millimeters (w x d x h/~5.12 x 2.80 x 0.42 inches) and weighs 185 grams (~0.41 pounds). It is much thicker and heavier than comparable smartphones. Apple's iPhone 5 only has a height of 7.6 millimeters (~0.30 inches, 29 percent less) and weighs 112 grams (~0.25 pounds, 40 percent lighter). This difference is noticed in a direct comparison. Samsung's Galaxy S3 has the bigger screen but is also only 8.6 millimeter thick (~0.34 inches, 20 percent less) at a total weight of 133 grams (~0.29 pounds, 28 percent lighter). HTC's Windows Phone 8X is also much lighter at 130 grams (~0.29 pounds) despite the same screen diagonal. 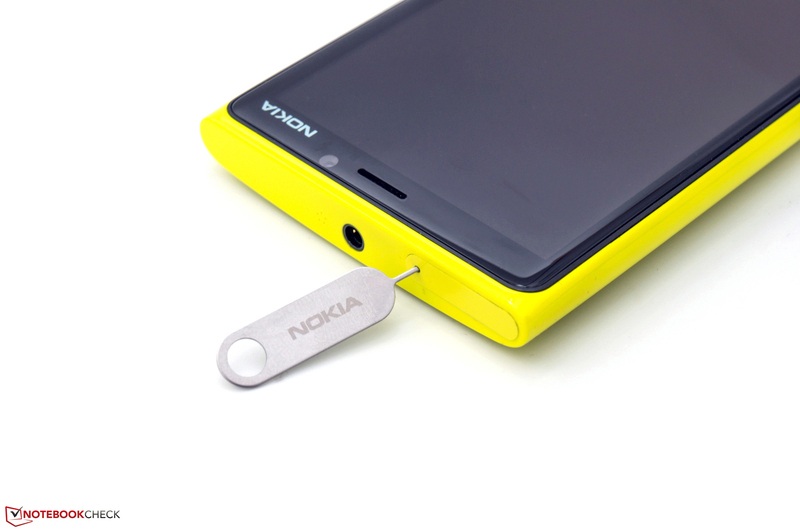 Nokia makes it easy and only offers the Lumia 920 with a 32 GB memory capacity. It is not possible to expand that via a memory card since the device does not sport a reader. To make up for that, the user gets a cloud capacity of seven GB in Microsoft's SkyDrive. The available interfaces hardly differ from the competition. The included headset can be connected to the 3.5 mm stereo jack and data sharing is possible via the micro USB port. The smartphone is also recharged over this port. Moreover, the Lumia can also be recharged without the cord via Wireless Charging and corresponding software. The company in conjunction with Fatboy also introduced a charging pillow at the launch. It is available in different colors for approximately 60 Euros (~$80). 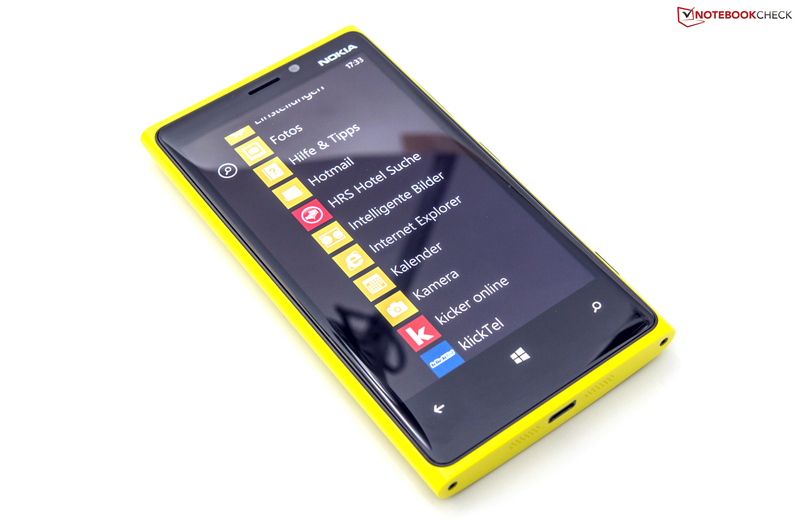 Microsoft's Windows Phone 8 is used as the operating system. 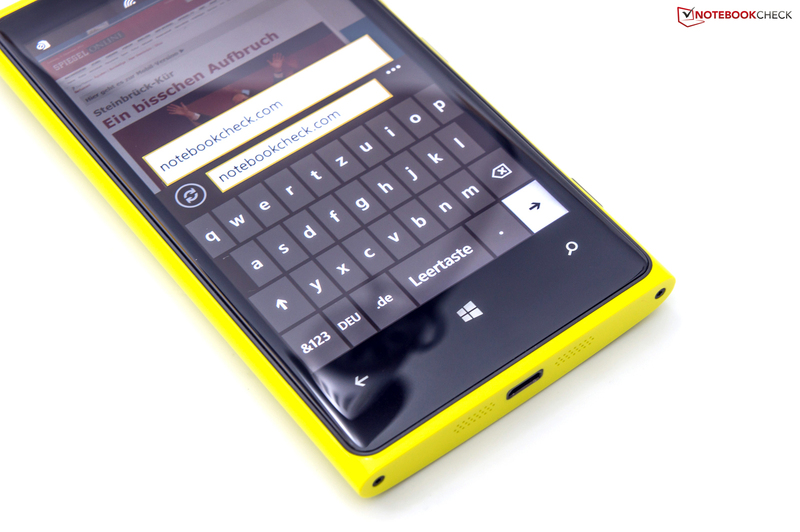 We recently scrutinized it in the review of HTC's Windows Phone 8X. 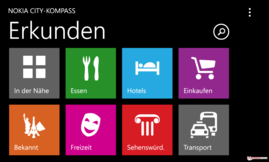 The handling is the same: The OS is intuitive in use and features a stylish user interface. The preinstalled applications are a unique characteristic in the same mobile operating system. Nokia has a few nifty treats in this field. In addition to the usual bloatware (HRS, sport news, news, local finder, etc. 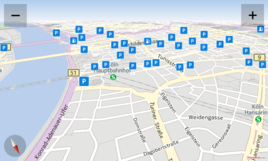 ), applications like Nokia's City Compass, Nokia Drive+ Beta (free navigation software with maps from Navteq) or Nokia Maps are nifty features. The latter mentioned three apps made a good impression in the practical test. 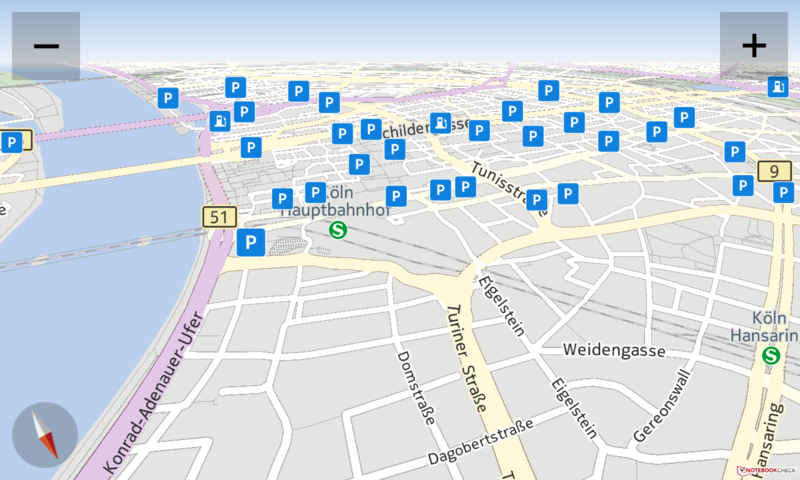 Excepting for Google Maps, decent navigation software for Android or IOS often has to be bought for a steep price. 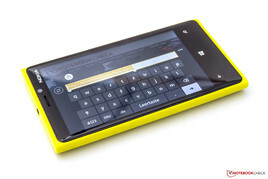 The Lumia 920 is versatility itself when it comes to incorporated communication options. Besides the fast Wi-Fi transmission standard 802.11 a/b/g/n in 2.4 or 5 GHz (dual-band), the smartphone also supports the short-range wireless technologies Bluetooth 3.0 and NFC (near-field-communication). The latest Bluetooth 4.0 revision is regrettably not installed for a faster data transfer. Moreover, matching peripherals such as a Bluetooth keyboard do not consume as much power. Nokia's smartphone is compatible with most networks worldwide owing to the support of the four main GSM frequencies (850, 900, 1800 and 1900 MHz). A modern peta-band LTE chip is integrated for mobile Internet access. Up to 100 MBit/s in download and 50 MBit/s in upload are possible with a corresponding mobile phone contract. In contrast to Apple's iPhone 5, the use of long term evolution (LTE) is not limited to only the network of the Deutsche Telekom. This is a big advantage for users who depend on fast connections. Of course, the chip is backwards compatible. In addition to LTE, HSPA+ (3G) with a maximum download of 42.2 MBit/s is also supported. The SIM card tray is designed for micro SIM standards. Bigger mini SIM cards do not fit in the device. Affordable Nano-SIM adapters are available at the mobile phone providers. Connecting to positioning satellite systems is fast thanks to A-GPS and Glonass. The connection is very stable outdoors. Reception only declines a bit in most rooms indoors. 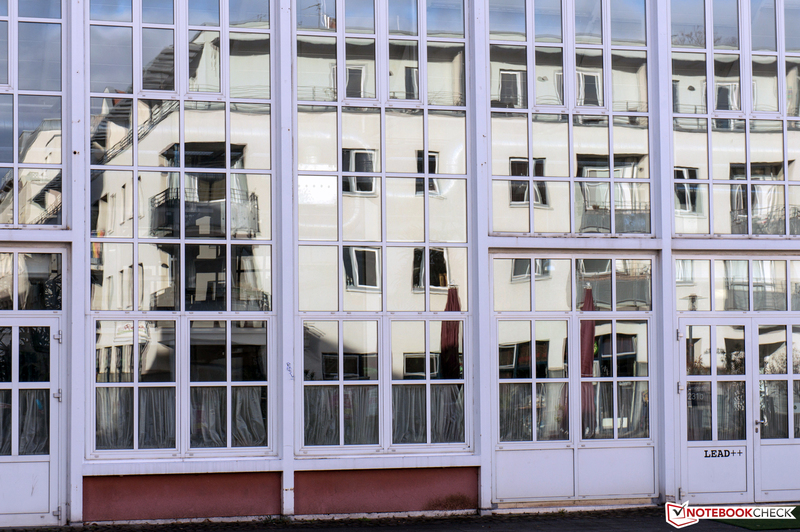 Problems could arise in rooms with thick reinforcing steel, basements or highway tunnels. Nevertheless, an overall solid performance from the test device. The corresponding tile is found on the home screen's upper left ex-factory. It can be resized, dragged or even deleted as desired. This function is available in the menu that is displayed by left-wiping over the screen. The functionality only looks different from other operating systems. Contact, search and mailbox icons are displayed beside the number pad. It is also possible to make calls via the browser or from an email in the system. The likely most important unique selling point of Nokia's Lumia 920 is the integrated primary camera, which the company labels "PureView". The module sports a BSI sensor with 8.7 megapixels, a Tessar objective from Carl Zeiss and an optical image stabilizer. The camera can shoot pictures in 3552x2448 pixels and videos in 1080p with 30 frames per second whereby it makes use of so-called pixel oversampling. Thus, more pixels exist in a smaller area. The image stabilizer is placed on a suspension mechanism which should enable taking pictures and videos in poor light conditions without major shaking. The automatic LED flash is engaged in this case and helps focus the picture more quickly. More details about PureView can be read in Nokia's white paper. A dedicated button is installed for the camera on the smartphone's right. The application also opens from standby when it is pressed. The test pictures we took were acceptable. However, the pictures look rather soft in daylight. The first tries in unfavorable light were compelling though. 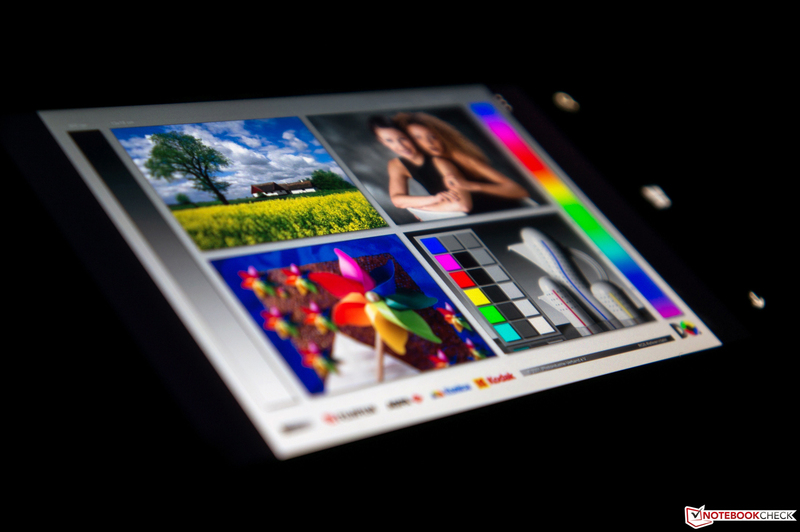 The integrated post-processing feature counters image noise directly on the smartphone. Nevertheless, you should not expect the picture quality of a DSLR. This also applies, for example, to the response time. We also had to reckon with less delay in our test device. 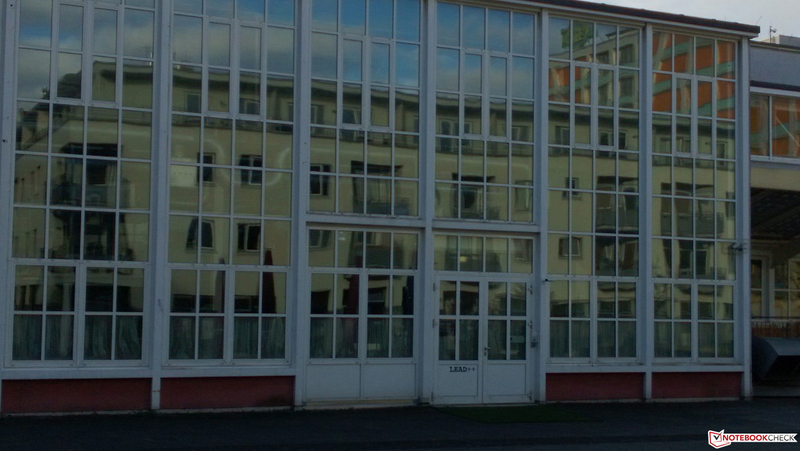 In our opinion, Windows 8's camera application does not do justice to the lens of Nokia's Lumia 920. The setting options are limited. In addition to four icons for flash settings, swapping the camera module, video recording and picture apps, more settings can be found behind the three points on the right. The most important detail settings can be made there. The image quality of pictures cannot be influenced. The pictures are made in a resolution of 1278x720 pixels, whereby the pixel density is increased through pixel oversampling. Overall, it is not a revelation for eager hobby photographers. The settings are sufficient for snapshots without high expectations. We tested the primary camera's optical image stabilizer (OIS) by foot, on the bicycle and stationary. Overall, the camera makes good pictures in a high-res 1080p standard (1920x1080 pixels, Full HD) with 30 frames per second. Owing to the continuous autofocus, you do not have to think about the picture too much. Of course, the performance cannot keep up with the quality of a high-end DSLR or action cam, such as the new GoPro Hero 3 featuring 4K support. 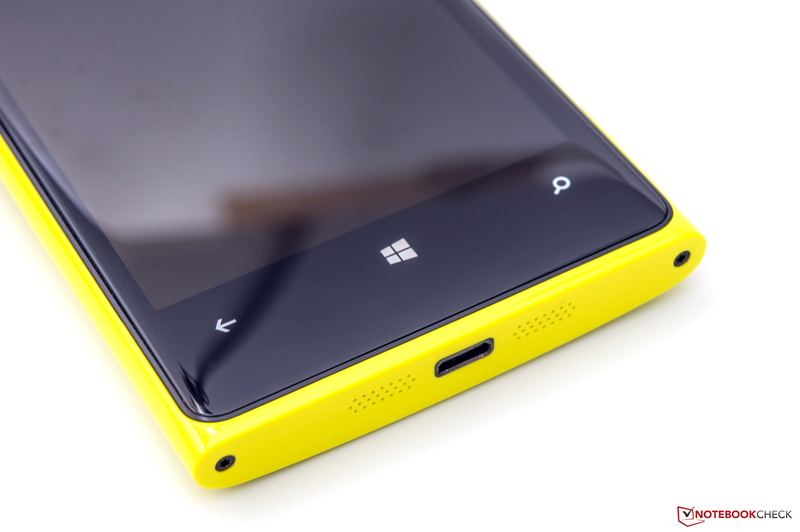 The front-facing camera in the Lumia 920 features a resolution of 1.3 megapixels. 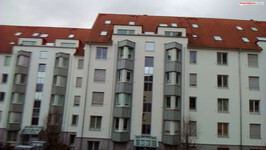 It exhibited a medial picture quality in the practical test. The picture remained relatively blurry and soft even after several tries. In return, there was barely any visible image noise. In addition to pictures, the module enables video recordings in 720p standard (30 fps). The quality is acceptable. The lens in Apple's iPhone 5 (1.2 megapixels) makes considerably more focused recordings with visible noise. The lens on the front is conceived for video chats. It is also well-suitable for that in the right light. Nevertheless, it is not a wide-angle lens. HTC's Windows Phone 8X features such a front-facing camera. The necessary things for immediate use are found in the box. 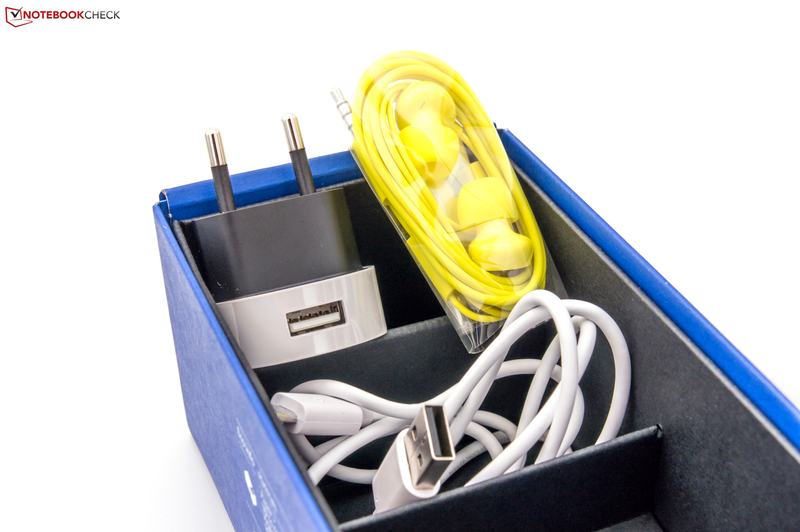 Besides the smartphone, we find a compact USB power supply unit with the corresponding cord, a very well-designed headset model Wh-208, printed documentation and a very small tool for opening the SIM card slot. The quick start guide is well-structured and definitely worth reading. 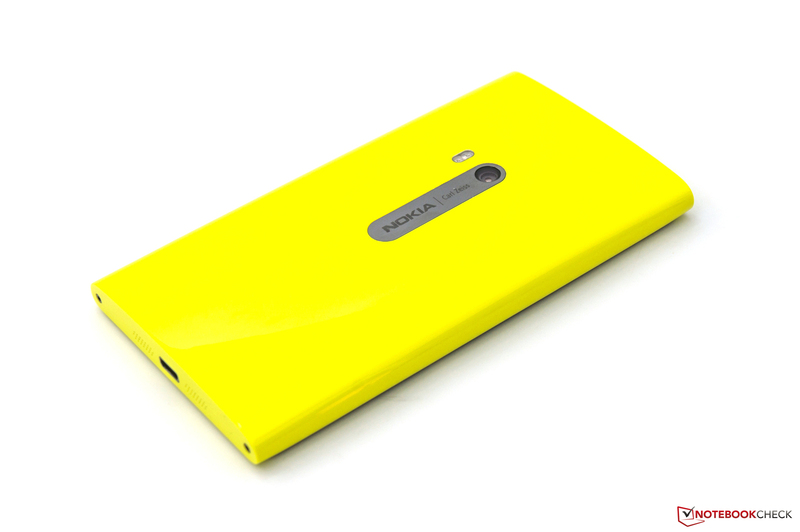 Nokia also offers a few accessories on the product website for the Lumia 920; among other things, products for wireless charging, various speakers and headsets. Nokia includes a 24-month warranty on the smartphone. As expected, the battery and accessories are only covered for 12 months. Interestingly, the PSU does not belong to the accessories and is only protected for six months by the warranty. A warranty upgrade is currently not offered on Nokia's website. The integrated Qualcomm Adreno 225 GPU is popular for games. Known classics like Angry Birds or Cut the Rope are found in the Windows Phone 8 store. Demanding 3D games like ShadowGun or Need for Speed known from Android and iOS are not available for download. Therefore, we opted for the insatiable monster from Cut the Rope and the very basic Logo Quiz. Both games could be played without problems or long load times. We could not test the graphics unit's full potential due to the aforementioned limited app offering. Inputting text is performed via the virtual QWERTZ keyboard that is automatically faded in depending on the application or presettings. The keys feature a rectangular shape whereby every single key is fairly tall. The keys on Apple's iPhone 5 look almost square in comparison. 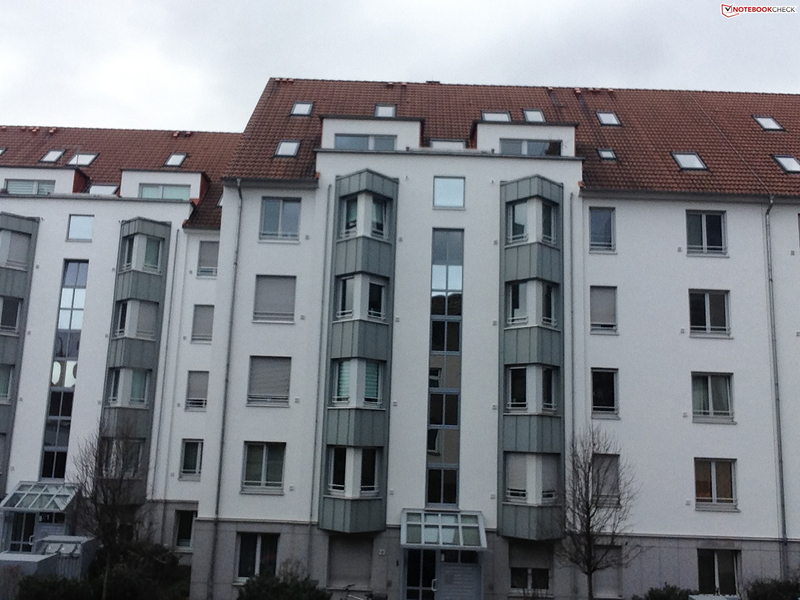 The layout also seems very cramped due to the narrow key gaps. Thus, it was all the more surprising that hardly any typos were produced in practical use and it made a good lasting impression. The capacitive multi-touchscreen detects fingers accurately. The keys are shaded in the selected color when touched, which was a bright yellow in our case. Microsoft, or respectively, Nokia loses the advantage in landscape mode. 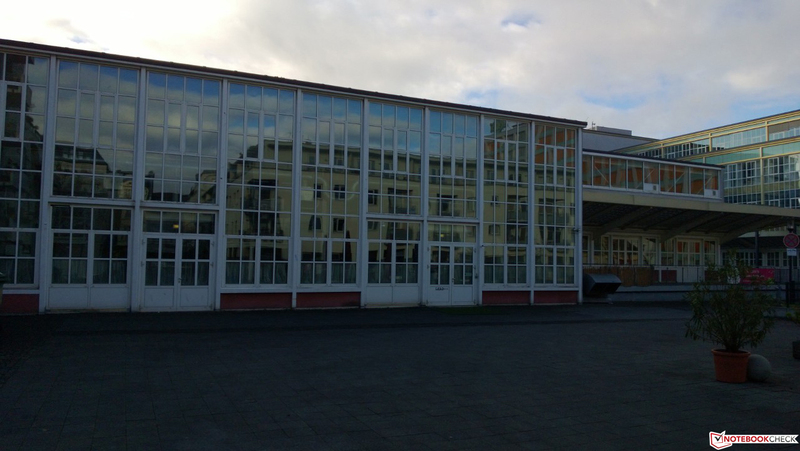 Although a lot of room is left vacant at the right and left edges, the layout is not straightened out. A total of about 1.8 centimeters of the available area remain unused. Otherwise, the layout does not differ in this position. A drawback is the fact that the virtual keyboard takes up over half of the screen in this mode. A positive feature is seen in Internet Explorer: The address bar is directly above the keyboard and not at the screen's upper edge like the case in other operating systems. This enables using the device with one hand without tediously changing its position. 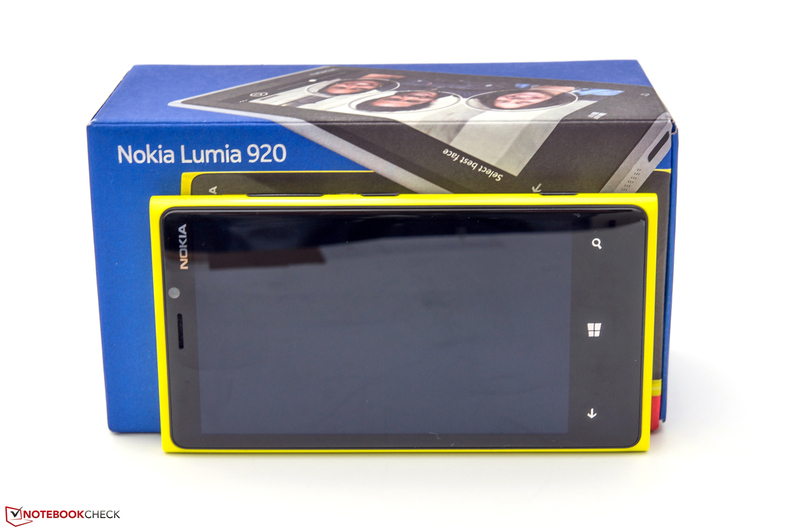 Nokia's Lumia 920 features a 4.5-inch screen with a resolution of 768x1280 pixels, which is protected by a layer of Corning's Gorilla Glass 2. The rounded edges are an advantage. It creates a pleasant feel even without the edging. The edges are very palpable. 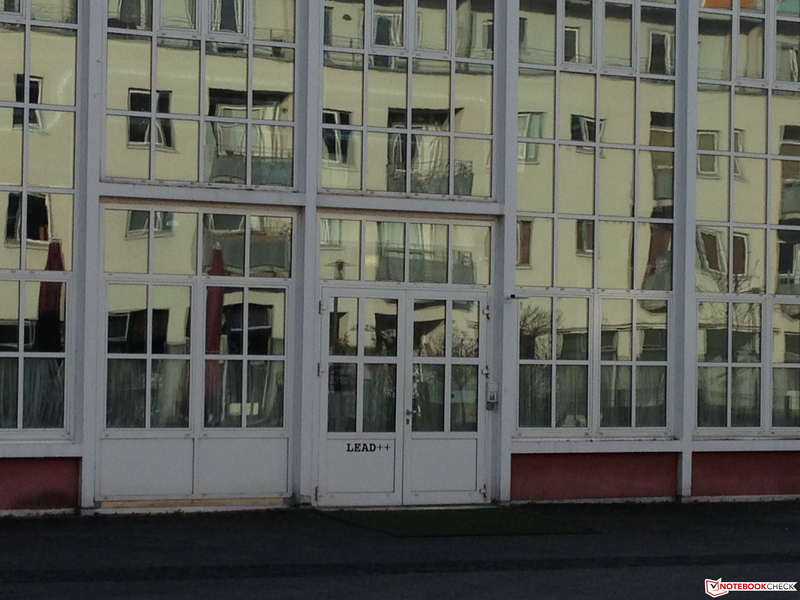 On the other hand, the additional layer of Gorilla Glass causes intense reflections. Nokia describes the used technology with the name "PureMotion HD+ Touchscreen". 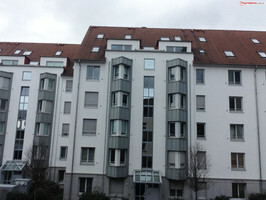 The screen is based on IPS technology in connection with LEDs for the light. Owing to a high pixel density of 332 dpi, the single pixels are not seen. Apple's iPhone 5 or Google's new Nexus 4 are on a par with 326 and 320 dpi, respectively. We first measure the LED screen's available luminosity. The screen achieved an average of approximately 322 cd/m² and is thus in a good midfield. The iPhone 5 stands out with an average rate of over 450 cd/m². Google's Nexus 4 is inferior with a maximum of 283 cd/m². But it is a good overall performance from the Lumia. The brightness of the available surface is an important point in this context. The test device reached very good 89 percent due to minor fluctuations. However, the device from Cupertino is again a bit better. The other assessed rates are compelling. A saturated black is reproduced due to a low rate of just 0.41 cd/m². Alongside the screen's good brightness, it results in a decent contrast ratio of 851:1. Subjectively, the color reproduction and image focus was absolutely satisfactory. The screen could be a bit brighter though, which would also increase the contrast. However, this is complaining on a high level. 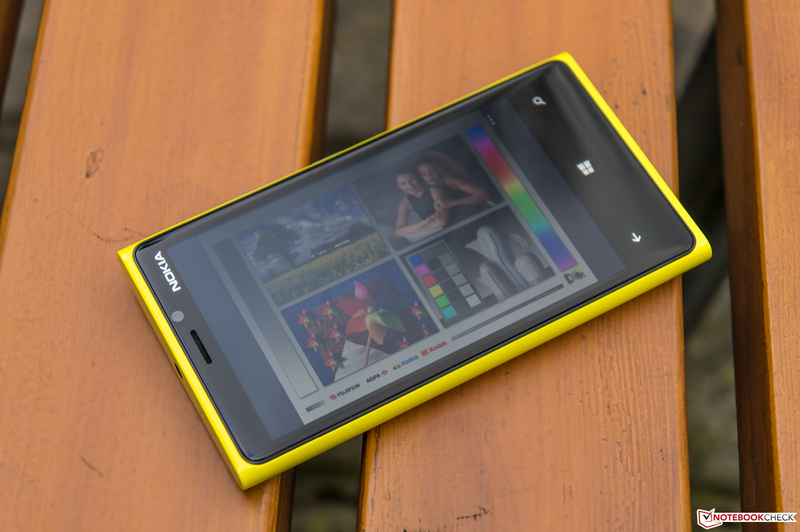 Nokia does not make specifications regarding color fidelity or sRGB coverage. 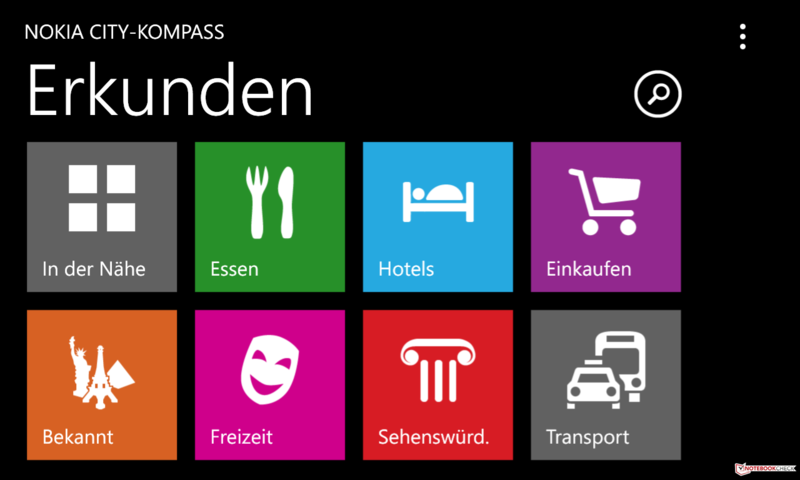 The Lumia basically does not have problems with outdoor use due to a brightness of over 300 cd/m². In view of the glossy surface, the LED light could be a bit stronger though. The content is always well-readable in overcast conditions. However, the smartphone could have difficulties in bright sunlight since the given brightness will unlikely defy the intensely reflective Gorilla Glass 2. The behavior in outdoor use can be compared to Google's Nexus 10 tablet. An extensive graph for the viewing angle stability is unnecessary for this device. The IPS (in-plane switching) technology Nokia uses is viewing angle independent. The colors do not deviate even when looking from the sides and the reference picture does not fade. Watching movies together with friends is rather unrealistic on a smartphone, but it would generally not be a problem. Qualcomm's system-on-a-chip (SoC) is to ensure good performance. 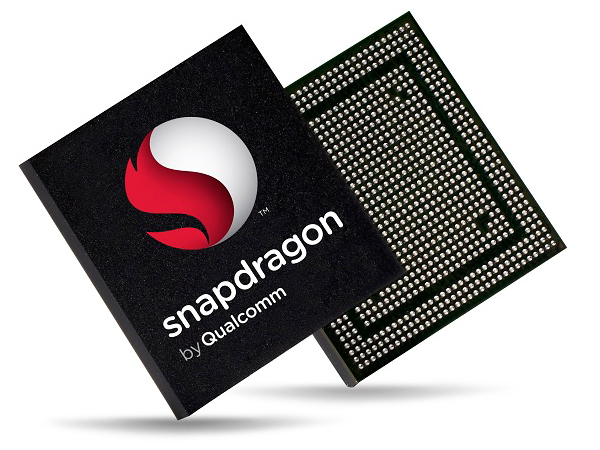 The implemented Snapdragon S4 MSM8960 is a high-end component that offers a computing power of 1.5 GHz. 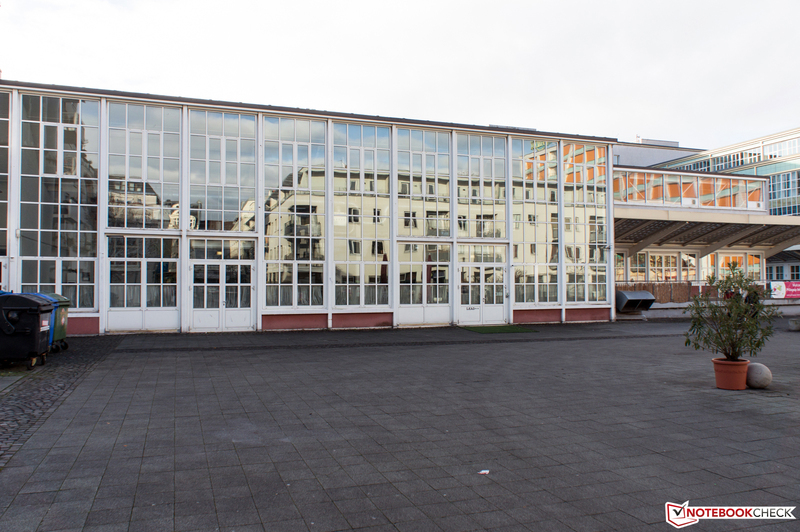 It is built in a 28 nanometer structure width and is based on the modern Krait architecture. It is considerably more advanced than comparable Cortex A9 from contenders. In a rough comparison, Qualcomm's SoC is on a par with the Cortex A15 modules. Both cores feature 32 KB L1 cache and a mutual L2 cache with a capacity of 1 MB. Another component is the aforementioned Adreno 225 graphics unit. In contrast to Adreno 220, the latest version clocks with 400 rather than 266 MHz. A small but important feature is the dedicated decoder for playing Full HD videos with up to 30 fps. 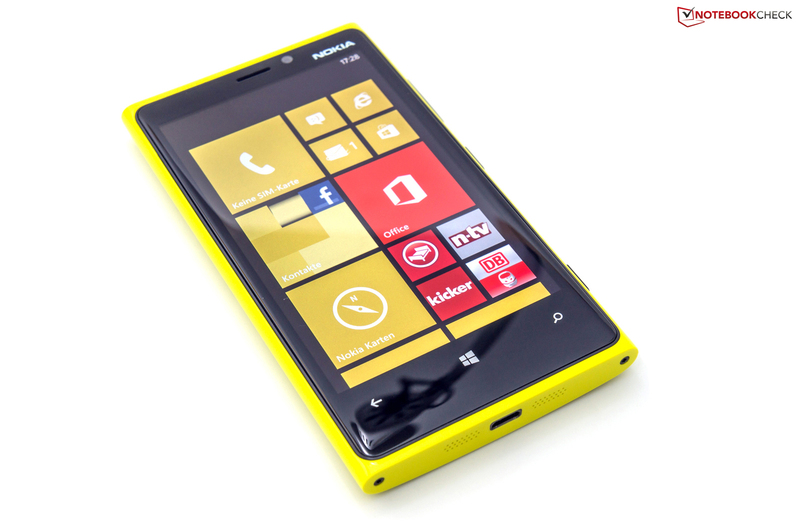 Nokia's Lumia also sports a 1 GB working memory and 32 GB of memory capacity that cannot be expanded. The option of choice is cloud memory. This makes a net capacity of 26.67 GB available for the user (83 percent). Compared with the previously reviewed HTC Windows Phone 8X, the hardware configuration is virtually identical. Various browser tests start off our benchmark course. 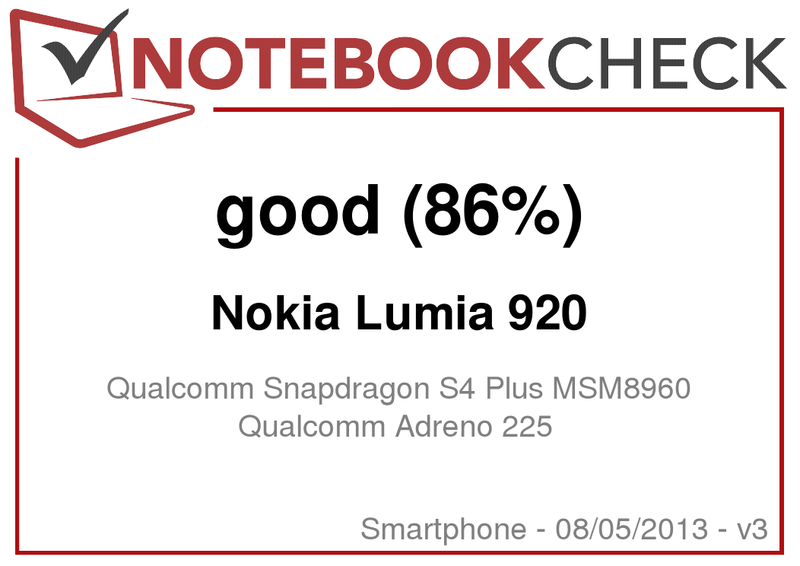 Nokia's Lumia achieved a score of 785 points in the latest revision of Google's V8 and is on a par with HTC's contending product. Both Apple's iPhone 5 and Google's Nexus 4 have a clear lead. The difference is 76 and 86 percent, respectively. Browsermark 2.0 records a similar result. However, we only have a comparison rate here. The lowest rate wins in the Java script benchmark Sunspider 0.9.1, and so does HTC's Windows Phone 8X with mere 896 milliseconds. Our test device and the iPhone 5 are close behind and Google's Nexus 4 scores much worse. The difference is over 100 percent. Verdict: The preinstalled browser's performance is depicted in these tests. Internet Explorer 10 used by Microsoft can only score in the Java script benchmark. Apple's mobile Safari scores well in all areas. Google's Chrome on the Nexus 4 exhibits a strong performance in Google's V8. However, the benchmark and browser both come from the same company. Finally, we performed the cross-platform benchmark AnTuTu v2. Despite several attempts, the GPU tests were abruptly stopped and the application was closed. Consequently, we cannot provide any comparable final scores. The working memory is swift, although Google's Nexus 4 clearly has the lead with 2 GB of RAM. 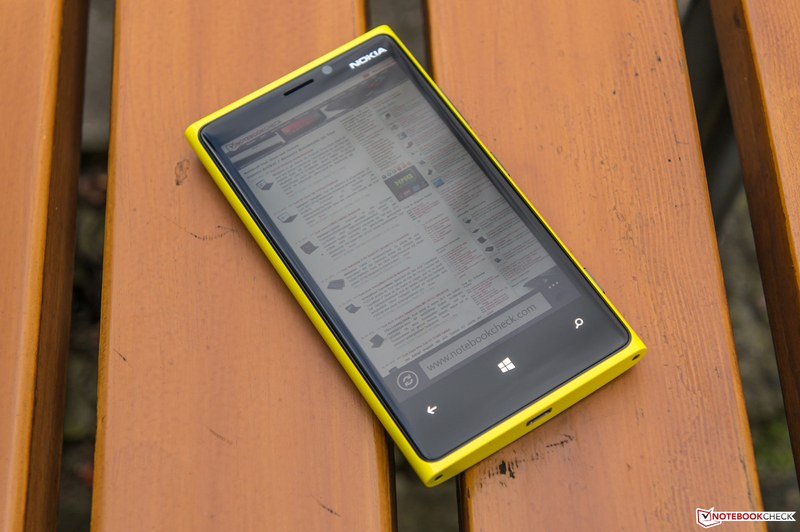 Nokia's Lumia 920 reaped in good rates in the other tests. Qualcomm's SoC is particularly impressive. Of course, it is also possible to make calls with Nokia's Lumia 920, although it is sometimes forgotten due to the innumerable possibilities. No weaknesses were noticed even after several calls. The speech quality was compelling throughout; the maximum volume of the hearer is also absolutely sufficient and the hands-free function does its job. The included headset model Wh-208 is very basic. Its sound is sufficient for calls, but it does not provide enjoyment when listening to music. Most users will tolerate the headset because it comes with different in-ear pads. Its build is acceptable, but we would have expected a higher quality product among the accessories. The temperature rates are an important issue especially for smartphones and tablets because the heat produced by the components can only be discharged passively from the casing. 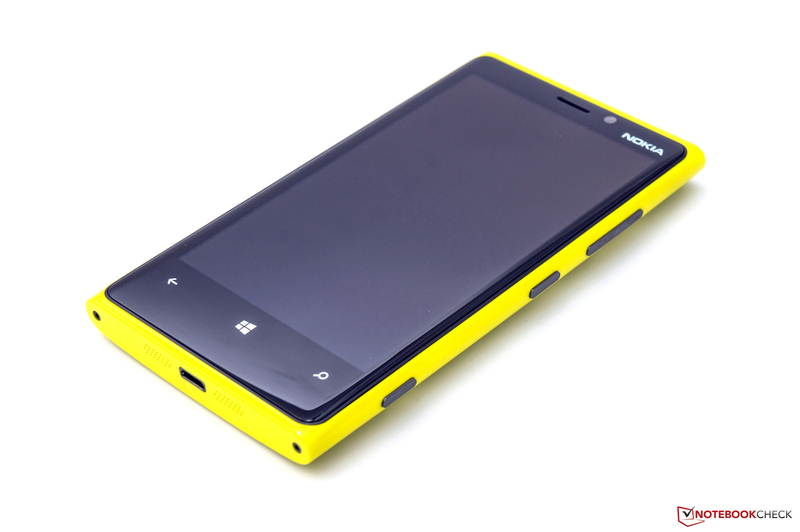 Nokia's Lumia 920 got lukewarm with a maximum of 34.1 degrees Celsius (~93.4 Fahrenheit) at idle. The rates were generally within an acceptable range in this scenario and can be compared with other devices. The rates increased during load, as expected. We could partly measure much higher temperatures after one hour of our stress test. The peak rate of over 50 degrees Celsius (~122 Fahrenheit) was reached in the lower rear area. Overall, the device got warm to hot depending on the subjective assessment in this test. HTC's Windows Phone 8X featuring almost the same hardware did a better job here. 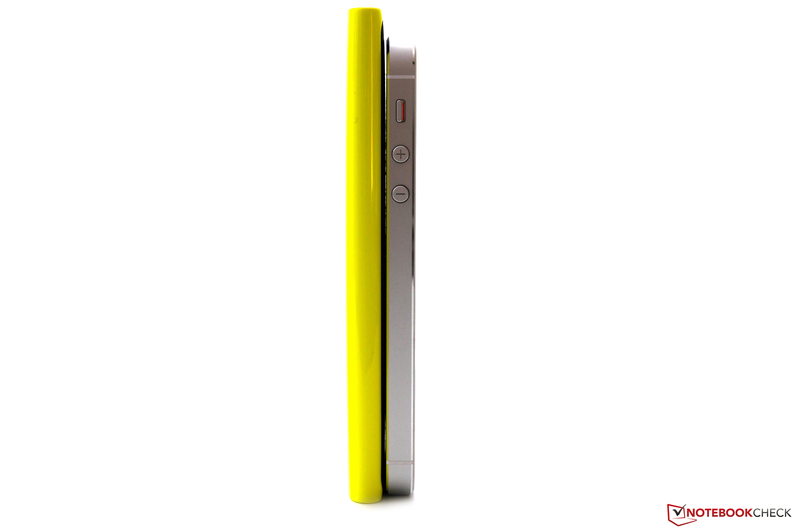 Two speakers are found at the smartphone's bottom, placed beside the micro USB port's right and left. Like in Apple's iPad Mini, a stereo sound is theoretically possible. However, it is only perceived when you place yourself directly between the speakers, which is quite unlikely. The sound is mostly limited to rendering trebles. Bass or low ranges are barely present and thus it makes an unbalanced overall impression. In return, the maximum volume is convincing since the sound does not distort. The level can also be fine-tuned quite precisely. Higher quality speakers or headphones can be connected to the standard 3.5 mm stereo jack. Besides Qualcomm's integrated SoC, the 4.5-inch screen is the device's biggest power consumer. 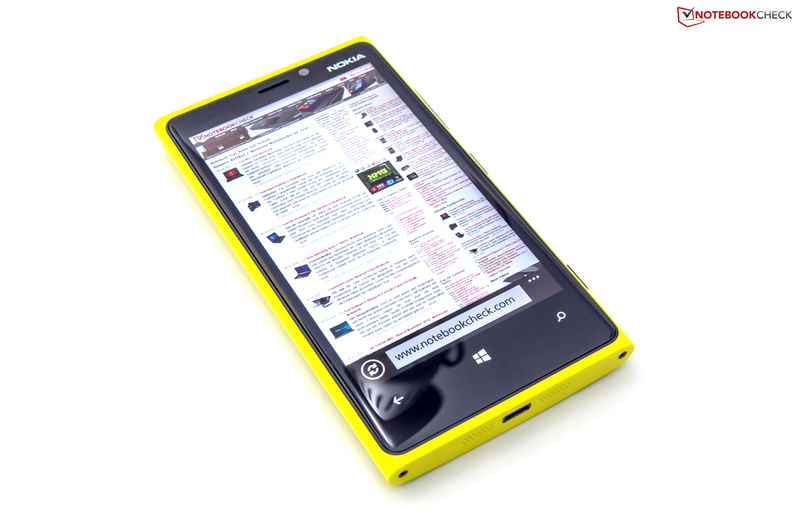 Nokia's Lumia 920 consumed between 2.1 and 3.9 Watts in office use. The identically configured HTC Windows Phone 8X consumes a lot less with a maximum of only 2.6 Watts. The difference of 1.3 Watts equals 33 percent. The winner of this assessment is Apple's iPhone 5 with a maximum idle consumption of 1.4 Watts (difference: 64 percent). 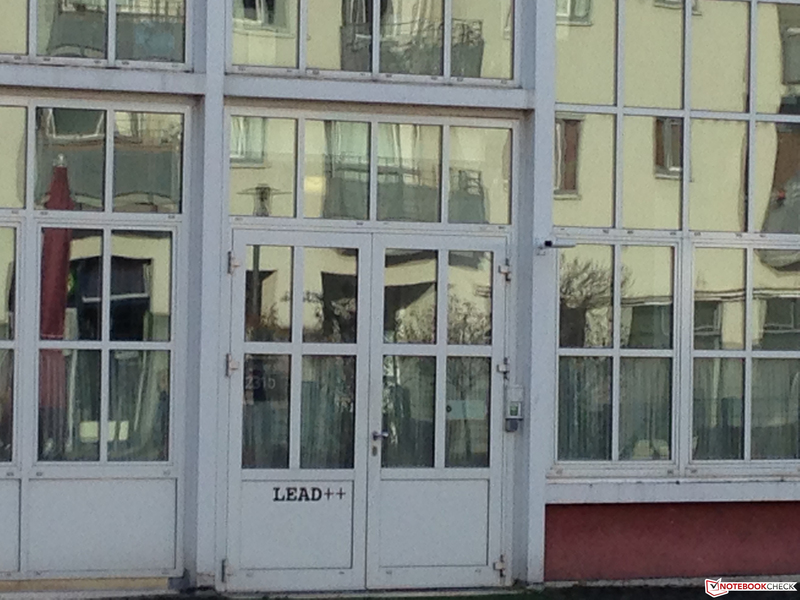 Nokia's Lumia and HTC's smartphone are on a par at load. The integrated lithium-polymer battery reaches a maximum capacity of 5.4 Watts. An overall good rate for this device category, although the iPhone 5 featuring Apple's new A6 chip is much more energy-efficient. The device has a lead of 52 percent with a peak rate of 2.6 Watts. 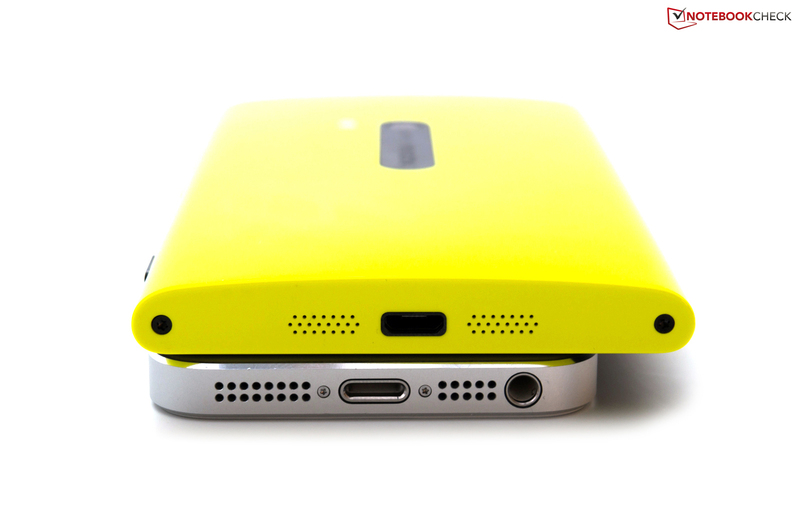 The consumption faces a non-removable battery with a capacity of 7.4 Watt hours in the case of our test device. Nokia does not intend the end-user to replace it. We performed our measurements complementary to the manufacturer's specifications of 460 hours in standby and around 11 hours of talk time with an enabled 3G connection. The maximum battery runtime using minimum brightness (WP8: low) and the Windows Phone 8's energy-saving mode starts off our assessments. Via an Internet-based script, we simulated reading a text document. The other mobile technologies were disabled. The result was a compelling runtime of over 22 hours. The iPhone 5 exhibited only a slightly lower runtime despite its smaller battery. HTC's Windows Phone 8X cannot keep pace with a runtime of 15 hours. The other extreme is the assessment during load using maximum brightness (WP8: high) and enabled wireless connections. We loaded the components with the application "WP Bench". Nokia's Lumia only lasted for 2 hours before it had to be connected to the outlet again. However, this is not unusual looking at the competition. Last but not least, we simulated Internet browsing using a script. A different website was opened every 40 seconds in medium brightness (174 cd/m²). The lithium-polymer battery's capacity was drained after exactly 14 hours. HTC's smartphone was also defeated in this test. Nokia's Lumia 920 is the new flagship from the Finnish manufacturer and is convincing in many aspects. For example, its solid casing, good performance, high-quality camera featuring optical image stabilization and the given features. NFC and LTE stand in good form beside dual-band Wi-Fi. On the other hand, the smartphone is quite heavy and bulky, does not sport a card reader and is often very warm under load. The 4.5-inch screen that Nokia uses offers a very high pixel density at 768x1280 pixels besides good rates. The brightness could be higher for outdoor use though. Overall, a decent smartphone with many assets as well as a few drawbacks. We believe Nokia probably seized its last chance in the form of the Windows Phone 8, although there is still room for improvement. This applies to both Nokia and Microsoft alike. 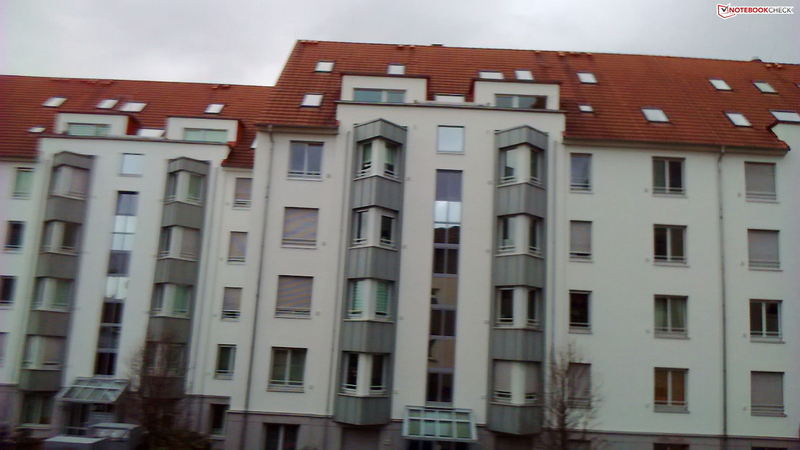 The QWERTZ keyboard, for example, does not exploit the full width in landscape mode and the Store still lacks the scope of applications known from Android and iOS. 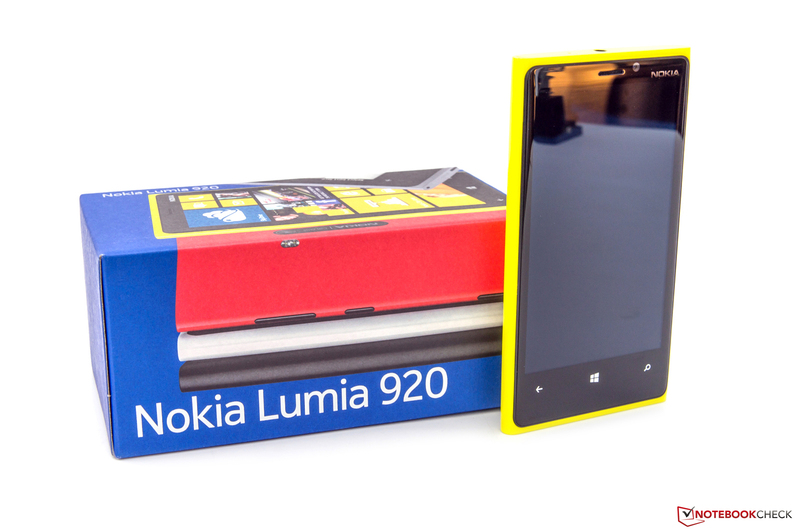 Nokia's Lumia 920 is certainly not a bargain with a price of around 650 (~$861). 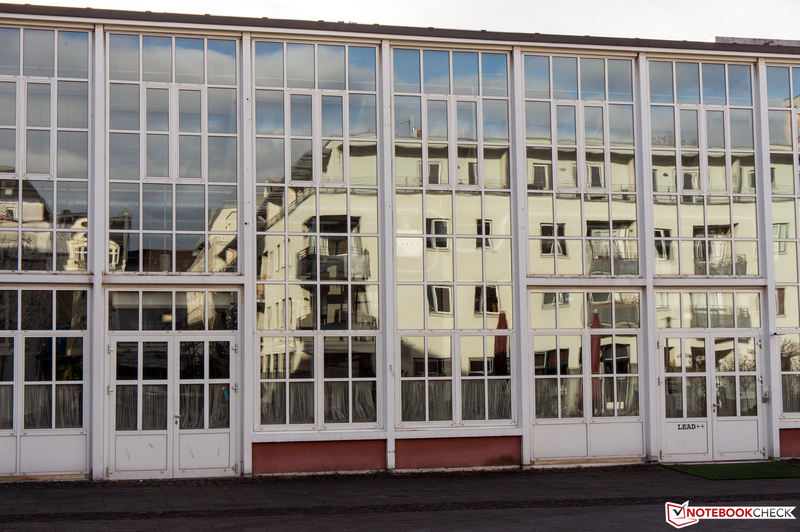 But the Finnish company also has two less expensive models in its range for tighter budgets. 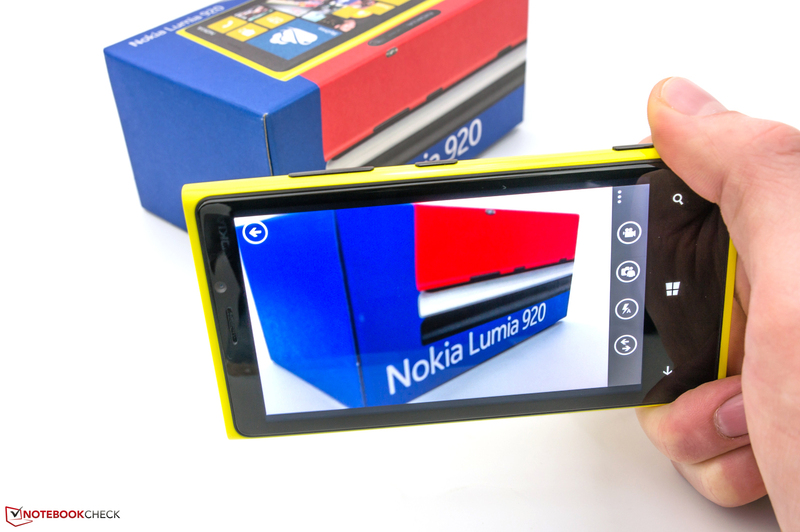 We tested Nokia's Lumia 920 smartphone. The front-facing camera has an acceptable resolution of 1.3 megapixels. The primary camera features 8.7 megapixels and an image stabilizer. A lot of content can be displayed on 4.5 inches at 768 x 1280. The LED illumination could be higher for outdoor use. All games are gathered in one application on the device. Nokia's City Compass is a stylish app with Augmented Reality. 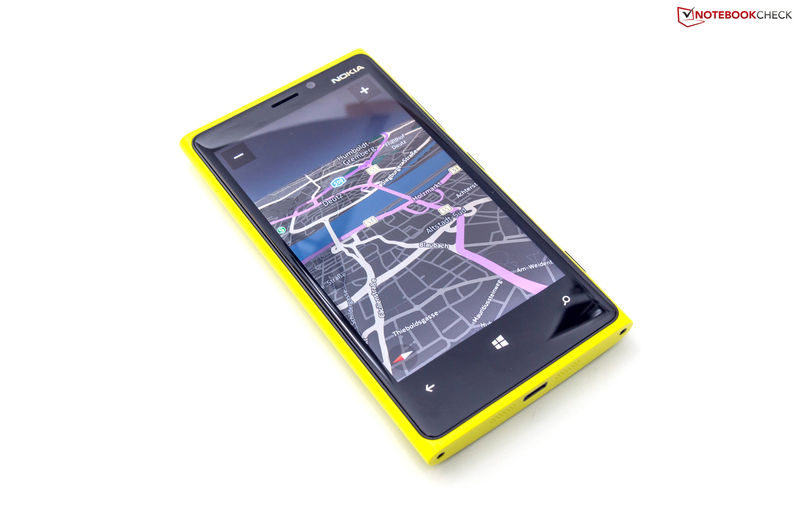 The Lumia can be used as a navigation system for free. Besides useful tools, a bit of bloatware is installed on the smartphone. Three touch buttons are located below the touchscreen. 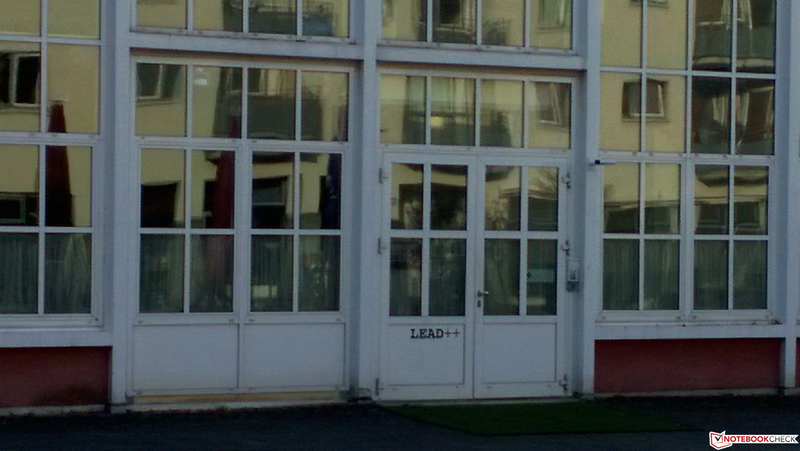 All hardware buttons are found on the right. Windows Phone 8 is used as the operating system. First information is found on the packaging. 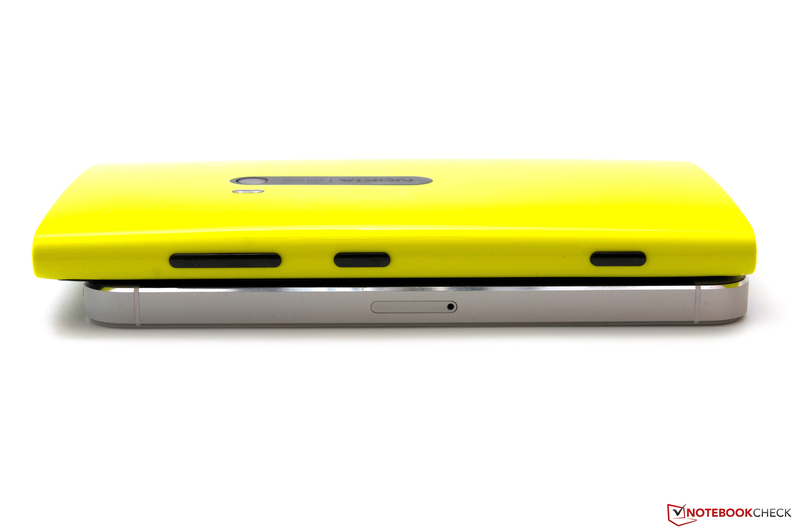 The Lumia 920's poly-carbonate casing looks high-end. The smartphone makes a comparatively bulky impression. It is thicker and much heavier than Apple's iPhone 5. The Lumia can be recharged via Wireless Charging or micro USB. A small tool for the SIM slot is in the box. The SIM tray is released by applying light pressure (micro SIM). 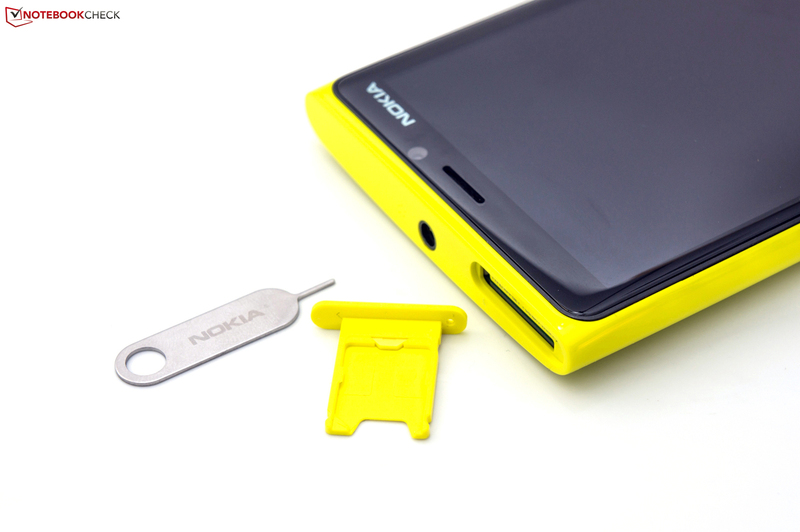 The bigger mini SIM does not fit in Nokia's Lumia 920. The headphone-out and the second microphone at the top. 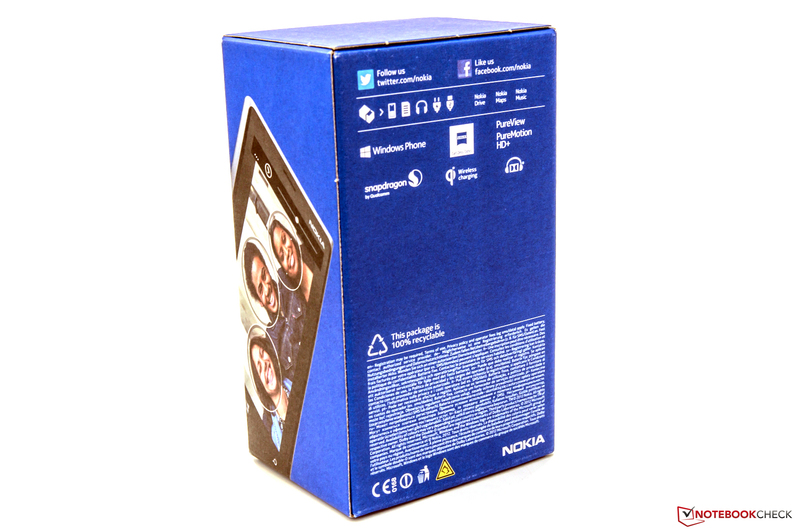 The unique design, the preinstalled applications from Nokia and the available performance. A more extensive app offers in Microsoft's store, lower waste heat during load and more extensive camera settings. 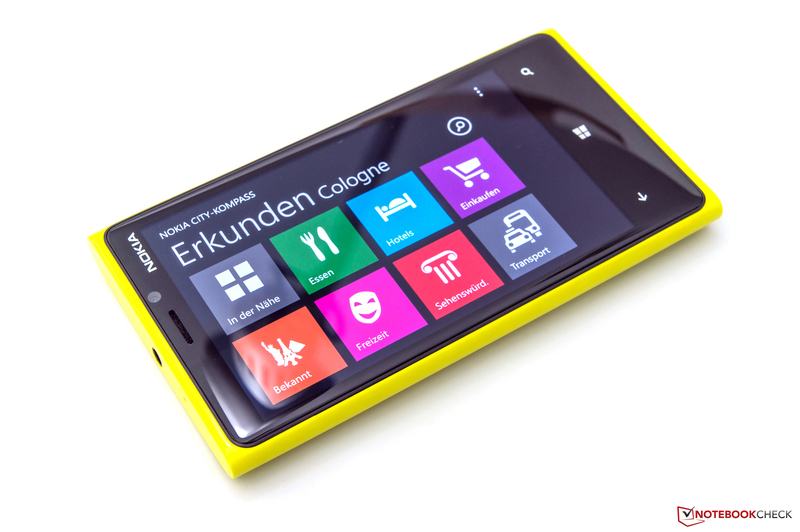 That Nokia did its homework and now offers a throughout competitive product with the Lumia 920. The next generation should however be slimmer and lighter alongside the same features. 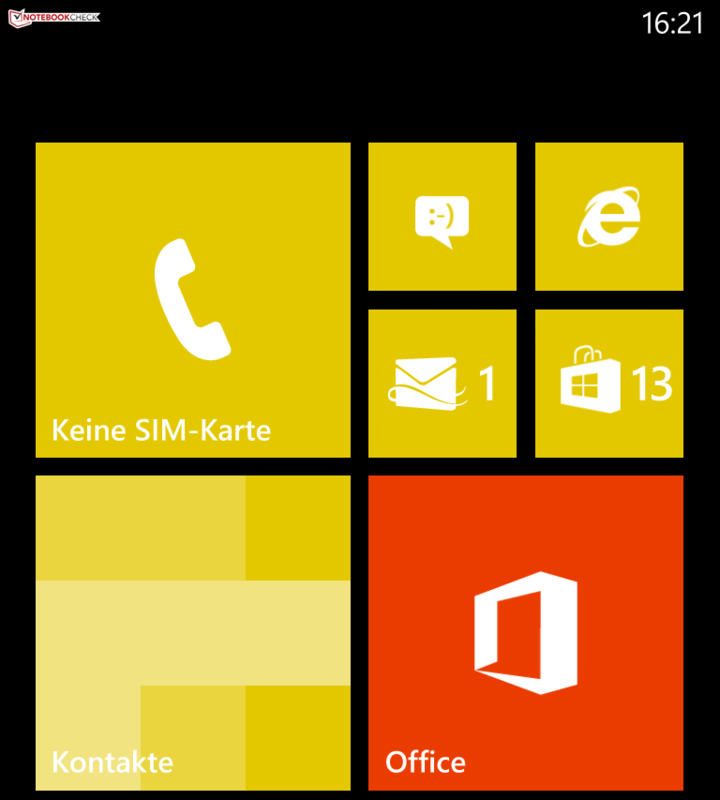 Smartphones featuring Windows 8. Among them, HTC's Windows Phone 8X with a slimmer casing and Samsung's ATIV S with removable battery. There are also various smartphones using Google's Android OS. Currently, Google's Nexus 4 is in the limelight. Last but not least, of course, Apple's iPhone 5 featuring a 4 inch screen.